Our adventure opens upon a battlefield. The year is 585 BC. Lydian soldiers clash with Medes. Blood flows; men die. After six grueling years of engagement, weary families wonder whether the fighting will ever end. An ominous rumor ripples across the field. The philosopher Thales had made a frightening prediction. Suddenly, the sky grows dark. [Day] was suddenly turned into night. This change…had been foretold to the Ionians by Thales of Miletus…. When [the soldiers saw it they] ceased from the fighting and were…eager…that peace should be made between them. From the description given, it appears the soldiers were fearful their fighting displeased the gods. As you may know, a solar eclipse occurs when the moon's inner shadow (also known as the umbral shadow) sweeps across the earth's surface. Its shadow is typically about 10,000 miles long—but only 100 miles wide. Anyone outside that narrow 100-mile-zone will not see the eclipse. Modern astronomy has confirmed that the umbral shadow of a total eclipse passed over the battleground during the Battle of Halys. So how did Thales of Miletus (THAY-lees of Mahl-LEE-tuhs) make such a stunningly accurate prediction more than 2,500 years ago? Scholars speculate, but we really do not know how he did it. As is true of many of the ancient philosophers, none of Thales' original writings survived antiquity. What we do know about him, we glean from secondary sources—ancient writers who recorded details of his life, his achievements, and his written works. Plato, Aristotle, Herodotus, and Josephus are among those who mentioned Thales in their writing, as well as the 3rd century AD biographer Diogenes Laertius (Die-AH-ja-knees Lee-AIR-tis), who wrote Lives and Opinions of Eminent Philosophers. Ancient Greek culture was dominated by its storytellers and myth-makers. Thales broke with tradition by seeking to explain natural phenomena without relying upon superstition and Greek mythology. Prior to Thales, life's mysteries were explained by poets like Homer and Hesiod, who described a polytheistic world ruled by fickle gods and goddesses. But Thales used careful observation and systematic thinking to explain the world around him. In so doing, he changed the course of history. We also discover from those sources that Thales traveled from his birthplace in Miletus to distant lands in search of knowledge. Josephus described him as a disciple of the Egyptians and Chaldeans (kal-DEE-uhns)—two nations that predated the Greeks by more than a thousand years. The Chaldeans, also known as the Neo-Babylonians, studied the skies for centuries and so acquired extensive knowledge of astronomy. It is likely Thales traveled to Babylon to visit its observatories. Speaking of stars, several ancient writers recount a comical story which involves Thales in a star-gazing accident. One writer presents Thales as the absent-minded professor who, while gazing at the stars, tripped and tumbled into a well. Another has him studying the stars' reflection in the well and leaning too far forward when the incident occurred. Whatever actually happened, we know that Thales made significant astronomical discoveries. In addition to predicting the 585 BC solar eclipse, he discovered the benefits of navigating by Ursa Minor rather than Ursa Major, the constellation upon which the Greek sailors had previously relied. Because Miletus was a bustling center for maritime trade, this discovery had significant financial implications. Astronomical calculations require an understanding of mathematical concepts. Little about Thales' travels can be stated with absolute certainty, but Laertius contends that Thales studied under Egyptian priests. Egypt was a source for mathematical knowledge, and many Greeks visited it, including Pythagoras, Herodotus, Plato, Democritus, and Euclid. Geometry had developed in Egypt in response to the need to redefine boundaries as flooding continually altered its landscape. Egyptian surveyors effectively used knotted cords as measuring devices. By Thales' lifetime, Egypt had long passed the peak of its mathematical development, which occurred in 1800 BC when The Rhind Mathematical Papyrus was created. The papyrus was filled with complex mathematical formulas. Thales may have gleaned mathematical insights while watching Egyptian geometers at work. His innovative application of geometry enabled him to calculate the heights of pyramids based upon their shadows and to determine the distance of ships at sea. 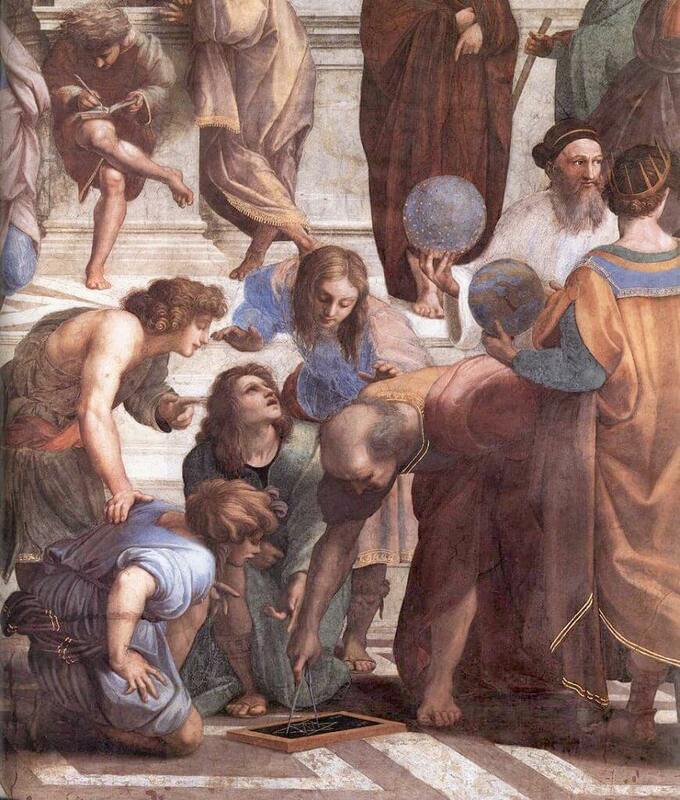 He is credited with originating five of the theorems listed in Euclid's Elements—13 volumes written in about 300 BC. Elements contains a comprehensive collection of mathematical definitions, propositions and proofs that have been instrumental in the development of logic and modern science, one of which has been named Thales' Theorem. The word philosophy—from the Greek words philia (love) and sophia (wisdom)— literally means “love of wisdom.” As we explore Thales' achievements in astronomy and geometry, we can see that, in the beginning of Western civilization, there was no sharp distinction between philosophy, science, and mathematics. Philosophers intermingled freely among the three disciplines in the pursuit of knowledge. Philosophy has given birth to the special sciences. When these grow into maturity, become specialized, and increase in detail, they leave the parental home and set up for themselves. Thus today we have many fields of study: logic, ethics, psychology, physics, botany, and biology, to name just a few. All of these are related to one another in some way, and the philosopher considers them all. But what makes philosophy distinct from all of the special sciences it has birthed? Philosophy is concerned with how things fit together. Ancient Greek philosophy began with a focus on origins and relationships. What is the essential substance from which all things originate? Is there one such substance, or many? Is it a material, earthy substance—or is it immaterial and other-worldly? Wrestle with these questions and you will gain insight into the philosopher's problem. Throughout the ages, philosophers have struggled to identify the basic origin and essence underlying all things. The technical term is the arche (R-kay). It is defined as the root, origin, source, beginning, or first principle. You may think of it as that from which all things come and to which all things return. 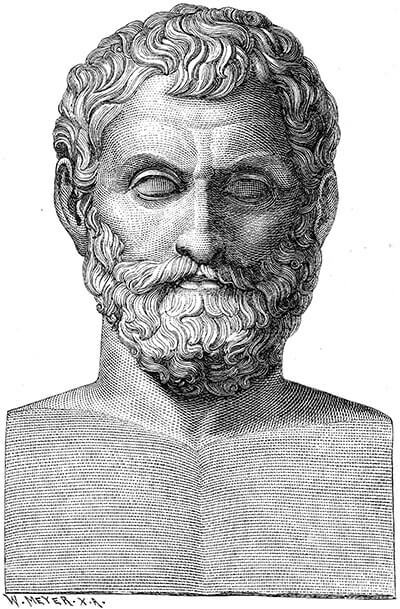 According to Aristotle, Thales believed that essence was water. Water as the arche was not an original idea. The Babylonian and Hindu creation accounts describe creation as beginning with a formless universe devoid of everything except a watery abyss from which everything else arose. These accounts are not dissimilar to the Christian-Judeo creation account. Did the philosopher Thales have access to the Hebrew Scriptures? We know he lived during the Babylonian captivity (587–538 BC), a period when the Jews of the ancient Kingdom of Judah lived as captives in Babylon. From Herodotus, we learn that the first Greek settlement in Egypt was a fort occupied by a Milesian garrison (ii. 154). The plot thickens as we learn the Prophet Jeremiah took refuge from King Nebuchadnezzar in that fort. Did Thales personally encounter the Prophet Jeremiah? Did he hear reports about him from Milesian soldiers who returned from Egypt? Whatever his exposure to the Hebrew Scriptures, Thales dismissed the Divine and all things supernatural. Instead, he took Western thought on a path whose destination would ultimately lead to naturalism—the belief that only natural laws and forces operate in the world, and that nothing exists beyond that natural world. If we imagine Thales carefully studying the properties of water, we can see a logical basis for his speculation. Ancient science explored three great mysteries: being, motion, and life. As to being, Thales observed that water can take the form of a liquid, gas, or solid. As to motion, he observed waves and currents, and concluded water contained within itself the power to move. Finally, as to life, he observed that living things are dependent upon water. When seeds come in contact with water—they sprout. When people are deprived of water—they die. His scientific observation produced a logical—though false—conclusion. Even today, scientific observation is still vulnerable to such error. According to Aristotle, Thales further theorized the earth to be a sphere that floated upon a body of water. Such an idea might occur to him as he viewed the floating Reed Islands nearby in Lydia. Consistent with this hypothesis, he attributed earthquake activity to rough ocean waters which tossed about these floating land masses. Speaking of rough water, Herodotus records a story in which Thales' engineering skills overcame the might of a river and enabled an army to cross the Halys River to engage in battle with Cyrus, the great Persian conqueror. As the story is told, Thales directed crews to dig channels to divert the flow of the river into two smaller streams. Herodotus doubted the story because he believed the soldiers crossed on bridges that existed at the time, though he noted they may have been heavily guarded. Perhaps this story says more about the notoriety of Thales' engineering prowess than it does about an actual historical event. Our final story focuses on fortune rather than on fame. Aristotle recounts how Thales had been mocked because of his poverty. As the story is told, through careful observation of the heavenly bodies, Thales concluded that the coming season would yield a bountiful olive harvest. He kept this prediction to himself. Despite his limited resources, he somehow managed to secure the funds necessary to place deposits for the use of oil presses in Chios and Miletus. When the olive crop ripened, Thales sat in the enviable position of possessing a monopoly on the presses. He made a large profit leasing them out. And, in so doing, he shrewdly answered those who reproached him. This text is taken from the first lesson in Philosophy Adventure™—Pre-Socratics by Stacy Farrell, a curriculum designed to help middle school and high school students learn how to write skillfully, think critically, and speak articulately while cultivating a biblical worldview. CLICK HERE for more information on Philosophy Adventure or click below to receive your FREE Thales Study!